The most storied earthquake in the history of the northeastern U.S. is the one that occurred about 4:30 a.m. on November 18, 1755. This earthquake had an epicenter probably about 30 miles east of Cape Ann, MA, and based on its felt area from Halifax, Nova Scotia to Winyah, SC and to the northwestern end of Lake Champlain, its estimated magnitude is 6.2. In Boston the Cape Ann earthquake damaged or destroyed about one third of the chimneys, bent a number of church steeples, and damaged several brick walls. Some streets in Boston were so covered with bricks that they were all but impassible. Damage to chimneys and brick walls was reported at several towns in northeastern Massachusetts, at Portsmouth, NH and at Portland, ME. The 1755 earthquake followed an earlier strong shock that was centered near Newburyport, MA on October 29, 1727 on the Julian calendar. This shock had an estimated magnitude of 5.6, and it damaged chimneys, caved in some cellar walls, and threw down stone fences in the Newburyport area. The 1727 earthquake was felt as far away as Philadelphia, PA and Penobscot Bay, ME. It was followed by over one hundred local aftershocks that were felt by residents in the Newburyport area. 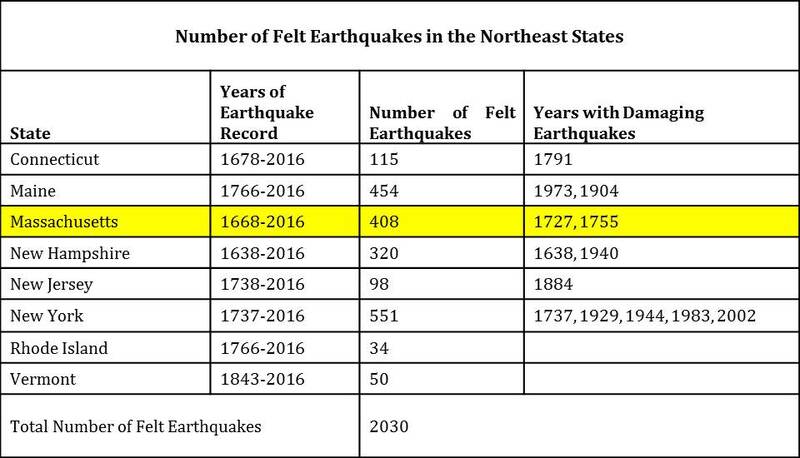 Northeastern Massachusetts experienced frightening shaking but with no reported damaged due to earthquakes on June 3, 1744 on the Julian calendar (estimated magnitude 4.7) and on March 12, 1761 (estimated magnitude 4.6). Moderate earthquakes that were centered in northeastern Massachusetts but that caused no damage took place on November 27, 1852, on December 10, 1854, on May 12, 1880, on January 21, 1903, on April 24, 1903, on October 15, 1907 and on January 7, 1925. On October 16, 1963 there was an earthquake centered near Cape Ann that had an estimated magnitude of about 4.0 and that caused some plaster to fall, cracked some brick walls, caused objects to fall from shelves, and broke a window in northeastern Massachusetts. It was followed by several smaller felt events during the same month. Little information is known about an earthquake that occurred on October 5, 1817. Walls were reported thrown down at Woburn, MA but additional details are lacking. There also were several moderate earthquakes centered in southeastern Massachusetts that were felt notably in the state but caused no damage. These events were on August 8, 1847, on September 21, 1876, on April 24, 1925 and on January 28, 1940 at 6:12 p.m. The residents of Nantucket Island were jolted by a moderate earthquake on October 24, 1965 that moved ornaments and dishes on shelves. 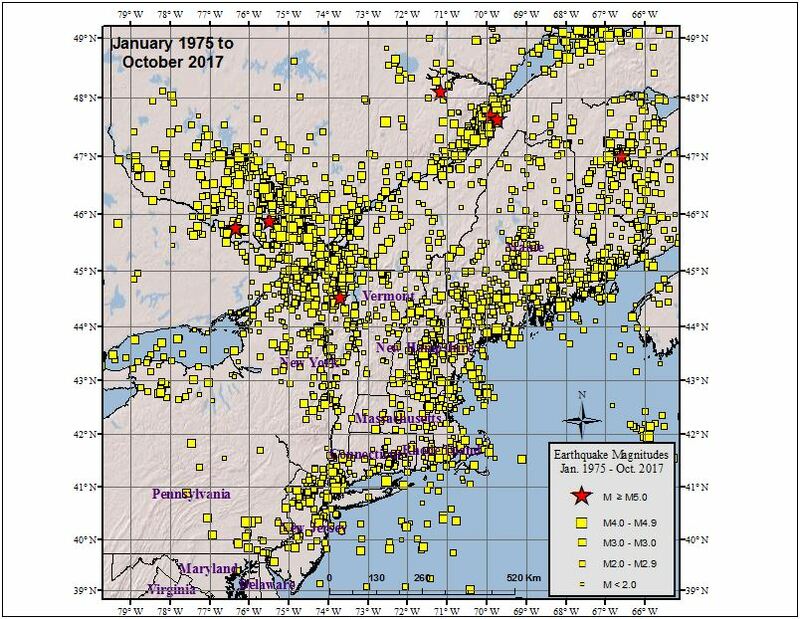 In all, over 400 earthquakes centered in Massachusetts are known from the earliest reported event on December 19, 1668 in northeastern Massachusetts through 2016. Most of the earthquakes have been in the northeastern part of the state, with also a large number of earthquakes were centered in the south coast area and Cape Cod. In addition, some earthquakes have occurred in the central part of the state. In addition to the earthquakes from within the state, Massachusetts also has been strongly affected by a number of earthquakes that were centered outside of its state boundaries. The June 1, 1638 (Julian date) earthquake, which is thought to have been centered north of Concord, NH and had an estimated magnitude of 6.5, was felt very strongly in Massachusetts. People had trouble standing without hold on to something, although no damage was reported in Massachusetts due to this earthquake. The February 5, 1663 (Gregorian date) earthquake, which was centered in Quebec and had an estimated magnitude of 7.5, damaged some chimneys in Roxbury, MA. The December 20, 1940 and December 24, 1940 shocks, which were centered in the Ossipee Mountains of New Hampshire and each of which had an estimated magnitude of 5.6, were felt strongly in Massachusetts but caused no damage. The magnitude 6.2 earthquake on March 1, 1925 with an epicenter at Charlevoix, Quebec was felt strongly enough in eastern Massachusetts that some people ran out of the buildings that they were in, although no damage in Massachusetts was confirmed due to the earthquake shaking. The magnitude 6.2 earthquake of November 1, 1935 with an epicenter in western Quebec was felt noticeably in the western part of Massachusetts but caused no damage. The same is true of the magnitude 5.9 earthquake of September 5, 1944 with an epicenter at Massena, NY. The magnitude 5.8 and 5.5 earthquakes on January 9, 1982 and January 11, 1982, both centered in New Brunswick, the magnitude 5.9 earthquake on November 25, 1988 centered north of Quebec City, and the magnitude 5.8 earthquake on August 23, 2011 centered at Mineral, VA were all felt throughout Massachusetts but with no damage reported.